Hines-Sight Blog: Ann Street Decadent Brownies from Beaufort, N.C. 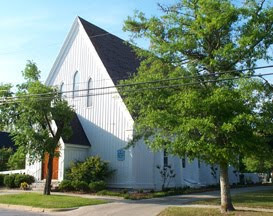 I'm going to share a great brownie recipe with you from St. Paul's Episcopal Church in Beaufort, NC as I wrap up the blog's road trip to Carteret County. I am linking up with Flip Flop and Pearls for Daphne's Recipe Swap. If you're just joining me today for the first time, my blog has been a road trip week to Carteret County located on the Southern Outer Banks of NC. On Monday, I showed you around the lovely and quaint town of Beaufort, NC which was our home base for Mr. Piggybanks' 45th birthday and a family wedding. Ann Street is one of my favorite streets in Beaufort. It runs parallel to Front Street which is located on the waterfront. Ann Street is home to most of the churches in the town and is the most stately residential street in the historic town with rows of beautiful trees. St. Paul's Episcopal Church hosts a great luncheon during the town's Old Homes and Garden Tour in June. On one of my past trips to Beaufort, I purchased the church's cookbook, "Let Us Keep the Feast in Historic Beaufort." The book was originally purchased in 2001, and has had three printings since its first publication. It is a great cookbook, but one recipe specifically caught my eye because it's named after the street I love. Mix dry ingredients and butter mixture, will be thick. Stir until blended, add eggs and buttermilk and stir until smooth. Pour into ungreased 9 X13-inch pan and bake for 30 minutes. Last 5 minutes of baking, mix frosting ingredients together and spread on hot brownies once out of oven, sprinkle with nuts if you like. Yield: 32 to 40 small squares. There is a a great store in Beaufort called the Scuttlebutt that sells numerous cookbooks from the area including the one I own. They say they even ship. If you can't buy one in person then getting one in the mail will be great, too. Don't forget to enter my give-away for a Thirty-One Thermal Tote. This blog post has all the details. If you refer a friend to the blog's Facebook page then you can earn extra entries.